I started bullet journaling around 2016. 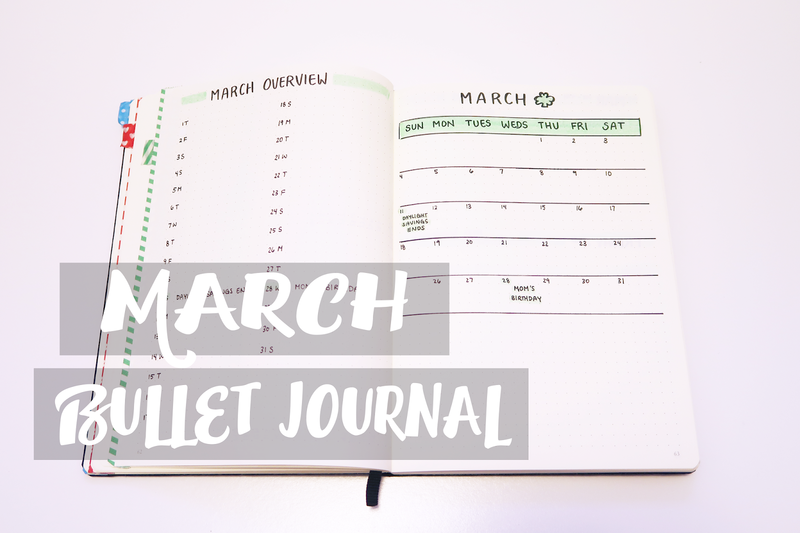 You can read my post about bullet journaling [here]! However, it wasn't until about July of last year that I decided to take it more seriously and take the time to update it every single day. I am currently using the Leuchtturm 1917 dotted journal. I would like to describe my bullet journal design as “minimalistic”. I don’t draw a whole lot in my bullet journal mainly because I find that I felt pressured to always have a perfect spread with perfect drawings. It made me not want to start / continue with my bullet journal because I would get so caught up with trying to have the perfect drawings and themes. So for my 2018 bullet journal, I decided to cut back on the drawings and strictly go for a more “functional” approach. I pick one color from my Tombow dual brush pen set and just continue using just one color through out the entire month. 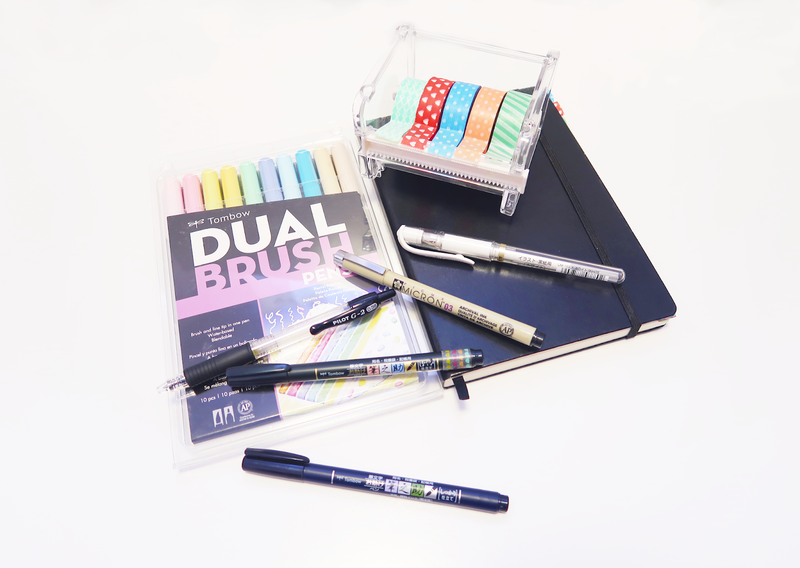 I guess you can say my bullet journal setup is for people who maybe want to start bullet journaling, but are intimidated by being unable to draw. This may be an approach that you might want to try out! 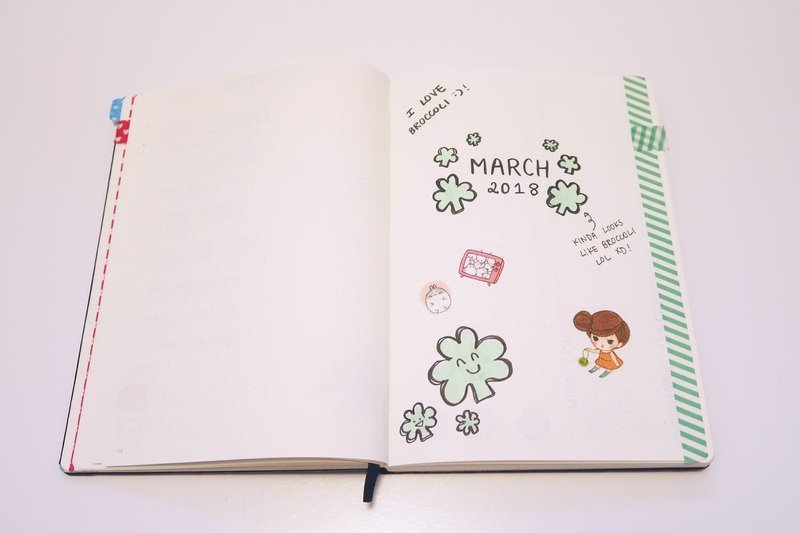 I originally started drawing the clovers on the cover page, but I realized that they kind of look like broccoli! I didn't feel like changing out the cover page, so I just stuck around with it. 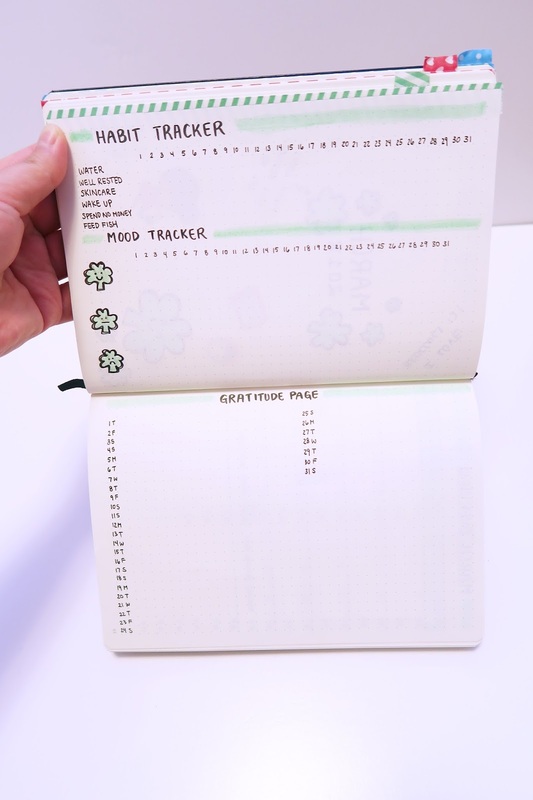 So this is how I track my habits and moods. 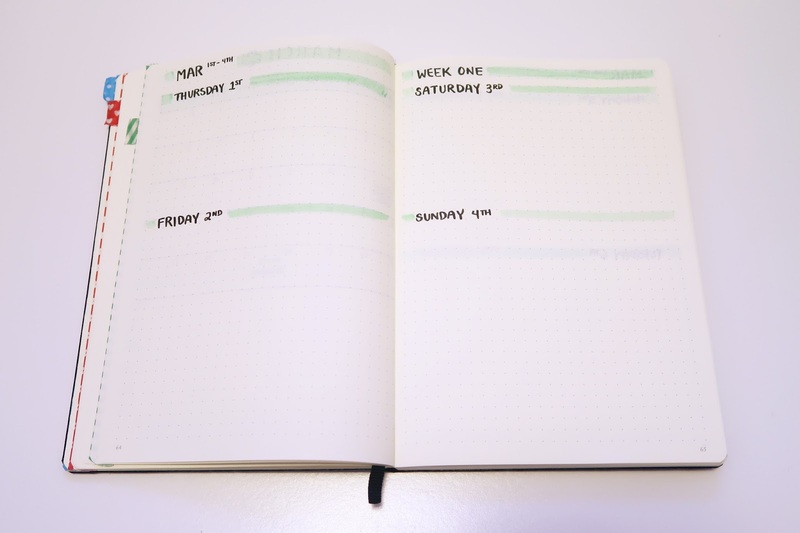 Basically, I fill in a square each day that I completed the habit and I place an X on the days where I did not complete the habit. For the mood tracker, I just place a dot on the line that corresponds to how I was feeling for the day. Then I draw a line from dot of the previous day. 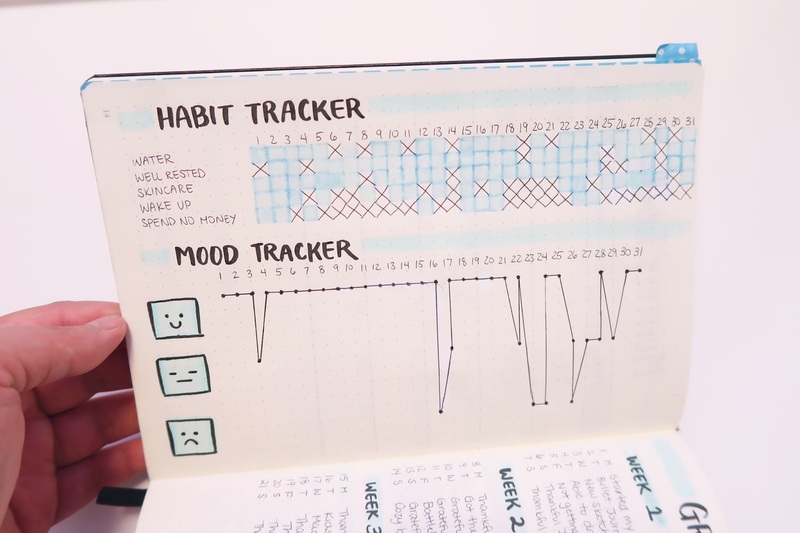 In the end the mood and habit trackers look a bit like the photo below. This page always looks the best when it is completely filled out. If you are wondering, I took this example photo from my January spread of my bullet journal! Like I said in the video, it might seem a bit redundant to have an overview page and the calendar view. 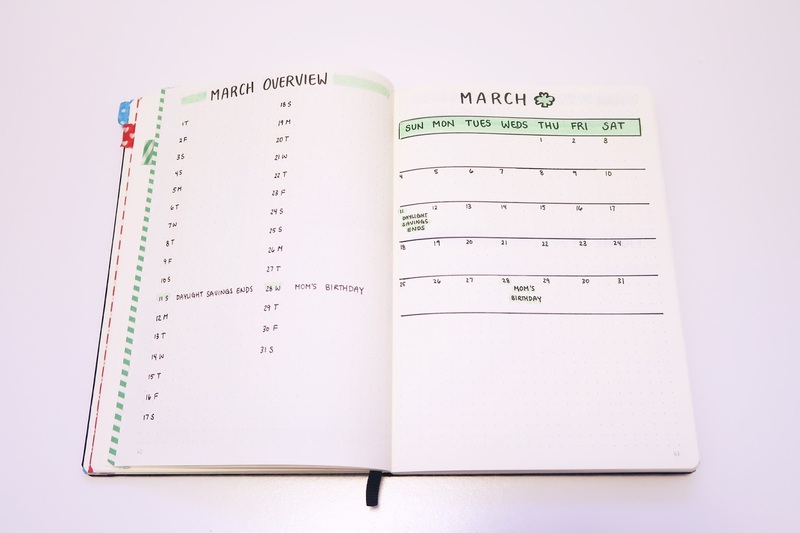 However, I kind of like being able to go back and plan out my month using this style! I keep my weekly spreads pretty spaced out. I write journal entries in each day so that is why I need the extra space. For my to do lists, I write them out in the corresponding spots. At the end of each month, I do an entire reflection. I just write down all of the interesting things that happened within the month. Sometimes, I'll tape in interesting things such as movie ticket stubs, receipts, or drawings into these pages. 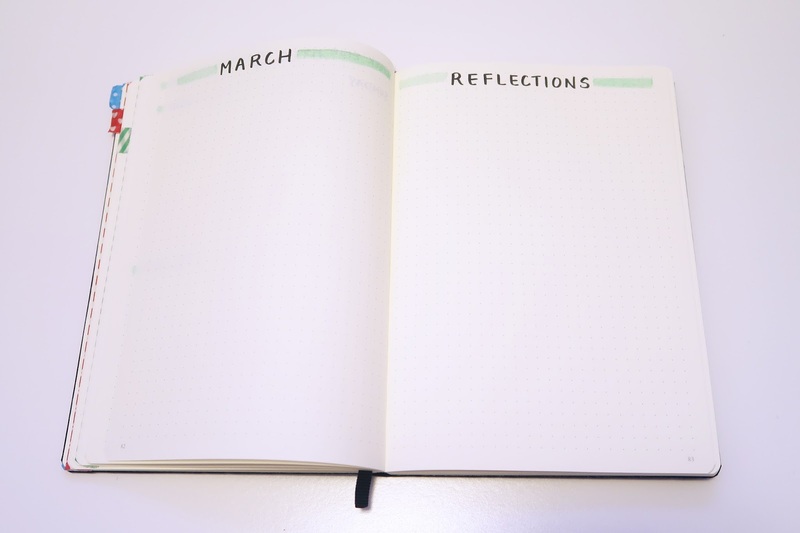 Also, if I learn something new in the month, I'll write it down in the reflections page!